Pardon the repetitive posts. 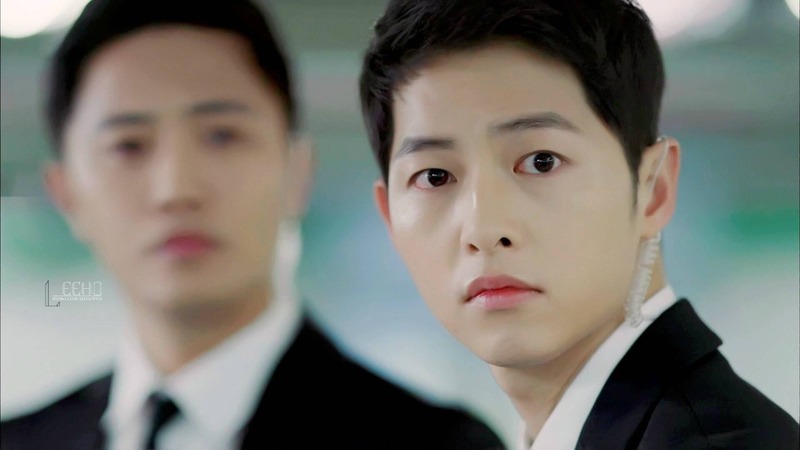 I promise, this will be the last time I will blog about Descendants of the Sun and Song Joong Ki. This Korean drama series is already over, but KBS prepared a three part special for the succeeding weeks. A little treat for the fans who can't get over the series. I read a number of reviews and I don't intend to contribute another one. I will surely end writing a biased review, especially for Song Joong Ki. ;) I will instead enumerate the reasons why I love this drama series. 1. It's Song Joong Ki - Like how many times his name appeared in this blog. I love him ever since I saw him in Innocent Man. I read his acting portfolio and discovered how he transitioned from small roles. 2. The transition of events - I dread drama series with 50 episodes and counting. I already lost the patience for series (even US based) with excessive number of episodes. 3. I love the cinematography - I'm not even sure if its called cinematography. But I love how the colours and texture of the drama series. If everything translates to an Instagram photo, I love the filters and edits used in the filming. And how could I not appreciate Greece? For those who have dreams of visiting the country, watching the drama series is a good idea to spoil your fantasies. 4. The stories of the supporting characters are not irritating - Although I'm still partial to the other love team, I love the side stories of the other characters. I love the combination of humour and short heart warming scenes. 5. Just the right amount of suspense - Prior to watching DOTS, I finished Yong Pal whose level of suspense made me nervous all the time. I was expecting the same for DOTS, given that the story evolved within the setting of danger and emergency cases. Surprisingly, DOTS never gave me those restless moments. Although it was already expected that something tragic is about to unfold in every episode, everything was presented in a lighter and gradual approach. 6. Humour element - with all the cheesiness around. For those who hate "cheese," there were a number of instances when everything was all about the cheesiness of the two lead characters. 7. The lead actor is not an impossible case of Jack of all trades - I love that Song Joong Ki was presented as a real human being at some point. There were times in the drama series when Song Joong Ki was not the lead savior. He was simply a great leader who acknowledged and trusted an excellent subordinate. To be more particular, when it was "Snoopy's" turn to detonate the bomb. If you landed here because of reviews and articles about Descendants of the Sun, thanks a lot. :) I swear, you will never regret watching the drama series. A few weeks ago, I saw Carlos Celdran's Instagram posts for the Design Week Philippines. #DWPhilippines It showcased Intramuros as one of the venues for the Center for International Trade and Missions' (CITEM) annual event. CITEM partnered with Viva Manila for the first Intramuros Pasyal. The event particularly showcased a two-day street fair of workshops, mural paintings, and live performances. I was not able to witness the activities. Instead, I saw the groups's attempts in creating better pedestrian lanes in Intramuros. Along the way, I also took photos of the magnificent and historical Manila Cathedral. I commend the group's advocacy of creating better Pedestrian Lanes. Although as observed, the efforts are still on the starting phase. Literally, there's still a looong way to go. :) I hope this will be finished before the opening of the classes. I will surely revisit the entire street to check the finished pedestrian line. As much as I wanted to blog about restaurants and food establishments, I rarely visit any these days. On weekdays, I treat myself to at least one nice meal from my typical list of fastfood chains. On weekends, I try my best to eat healthy home cooked meals. There are times when I resort to food delivery, which surely tastes and feels so monotonous. A few days ago, I received an email from the team behind Pipa Brick Oven Pizza and Pasta. I got curious with their concept of fried pizza. It sounds too oily and sinful, but never mind. Hahaha Life is too short not to enjoy great food. While my glutton self wanted to respond to the invitation, I had apprehensions attributed to location issues. In my mind, this might be another restaurant thriving down south. Imagine my surprise when I discovered that the place is right inside my hometown. Yooohoo! Hence, I decided to drop by the place on one lazy Sunday afternoon. The place allows you to assign your own table name. Cute! Ours was named after our favourite pet dog. As recommended by one of their staff, we ordered Pipa Pasta. We loved this red sauce pasta. The noodles were perfect and we love the creamy texture of the sauce. The only drawback, the serving is quite small for someone with a huge appetite. But with the cost of only Php 99, I believe this is already a great deal. It was a little challenging to choose which pizza to try. We again opted for their best seller, Many Pacquiao Supreme. So this is their signature thin crust pizza, fried and baked in a brick oven. Maybe my picture does not do justice, but this was one of the best decisions I made in my entire life. (Okay, I'm a little exaggerated Hahaha) The meat and vegetable were fresh. The pizza sauce was perfect. Not too overwhelming. And best of all, the pizza was not exaggeratedly oily. My "oily" expectations did not happen. Hahaha How come? As proof to it, the paper lining used for the pizza was not totally submerged with oil. The pizza likewise did not cause the usual oil residue on my fingers. Typing this, I suddenly remember my dearest Korean friend, Jenny. My friend can't help but notice that most pizzas in the Philippines consume so much oil. I would surely bring Jenny to this place if I discovered it earlier. We took home two more flavours, Whitney Houston Pizza (dabbed as the White Pizza) and the Baconor Mcgregor. Both two tasted great and even got the approval of my health conscious parents. My mother can't believe that the pizza was fried at all. Everyone at home loved the "less grease" and the crunchiness of the crust. For those who prefer thin crust pizza, you will love Pipa's version of fried and baked. The crunchy crust was something new for me. As told by Chef Don, they claim to be the first in the Philippines to introduce this innovation. I also learned that Chef Don majored in culinary arts, worked abroad and this pizza innovation was his passion, which in fact became his thesis project and now, a promising business. I was also introduced to their signature Pipa Spice. Originally developed by their team, the spice is a mixture of homegrown herbs and spices that complements their pizza. And because I was curious with and fried and baked pizza, I asked Chef Don if I can view the process from the kitchen. The ingredients are placed on the pizza and baked in a classic brick oven. Big thanks to Chef Don, Alie and the entire team of Pipa Brick Oven Pizza and Pasta for inviting me. Pipa Brick Oven Pizza and Pasta is located at 59 E. de La Paz St. San Roque Marikina City. The stretch of E. de la Paz St. is quite long. It starts from the border of San Roque to Calumpang until the Marikina Public Market. If you have your own car, use Waze to lead you to the place. Commuters can easily reach the place too. Jeepneys bound to Marikina Market, Cubao or Barangka, which originated from the routes of Pasig or Calumpang directly passes to E. de la Paz St. An easier alternative take the brown or maroon tricycles near the Marikina City Hall. Pipa Brick Oven Pizza and Pasta is still on their soft opening stage. Although all items in the menu are already available. The Php 99 pizza and pasta will not last a lifetime. Friends, #walangForever Hahaha Take advantage of their on going promo while it still lasts. A few more weeks before the national election, all I see within my immediate environments are tarpaulins plastering the "photoshopped" faces of the different candidates, status messages and defense about this "popular" presidential candidate in all social media platforms, and on a few instances, taxi drivers discussing their sentiments about the country's political system. Despite having a degree in Economics, I have to admit that I don't enjoy political related discussions. I'm starting to feel bored when someone claims that our country's form of government should be revised. The best structure is like this and that.... My attention is going somewhere else. I have always been a firm believer of the rule of parsimony. The simplest is always the best. At the end of the day, all I wanted is for everyone to do their job and for someone to finally improve the country's infrastructures and transport system. Those platforms about poverty, children, senior citizens no longer appeal to me. I wanted someone who can understand the domino effect of having a state-of-the-art infrastructures and a very efficient transport system. I have also been listening to debates and TV show interviews and so far, I haven't found the candidate who shared my sentiments. I have Facebook friends who imposed their own social media "breakdown" or hiatus. They claimed to have been saturated and irritated with the entire election saga. While I can understand the feeling of seeing the same articles over and over again, I sometimes feel entertained whenever a Facebook friends defends his / her preferred candidate. Hahaha Also, I don't see the need to voluntarily submit to temporarily deactivating social media accounts. Com'on, you cannot afford to miss anything these days in Facebook! And while I'm talking about elections, I'm sharing here the building that becomes the busiest in times like this. I love Palacio Gobernador, the building that houses the Commission on Elections (COMELEC). A few days ago, I learned about the fresh college graduate who managed to hack COMELEC's information website. The kid was arrested in his own home, much to his father's surprise. I have to admit something. While the kid has to be punished under the rules of law, part of me admires his capability. If I was the kid's professor on his major IT subjects, part of me will surely feel proud. I know! I know! I was aware that capabilities should be devoted for good use. But still, part of me admires the kid. Consequently, I felt irritated that our government agency cannot even protect their own website. Setting aside the election fever, here's my recent haul from the The Face Shop. Among the various Korea Beauty shops operating in the country, this has to be my favorite. I scored everything almost free. I used the accumulated points from my lifestyle card. Hooray! And thank you to the sales associate from Gateway Mall branch who suggested checking the points from my card. The great Nivea sale! - I was one of the many hoarders consumers who took advantage of their 50% off on all items. Also, thank you to Ash and Muff for my personalized blanket..... and for those who might be wondering, yes I use the "bottom" ointment for a variety of purposes Hahahaha Surprisingly it can serve as a skin moisturizer for me. I received so many postcards this week. Thank you Marieken and Terra! As someone who works for a Catholic school, I have the privilege to experience retreats and recollections every year. Years ago, we used to be brought to Caleruega. We have a spiritual and out of town break at the same time. This year, we only had a half-day recollection at the auditorium. It was a short session but everything felt so meaningful for the first time. Hats off to our recollection master, Fr. Filemon dela Cruz, O.P.!!!! He appeared to me as the kindest and wisest grandpa we all wanted to have. After the recollection, we were given a rosary and a small wooden cross as souvenirs. I have received recollection souvenirs for a decade already and I have to say, this was the best I received. I love the concept of the Holding Cross. I love that it appreciates and values the silent and unsaid prayers. The cross would also make it as a great gift for friends and loved ones suffering serious illnesses or undergoing a major crisis. And lastly, I've been addicted and obsessed with wine and cheese lately... added to this my attempts to create a creative ensemble from the objects at home.